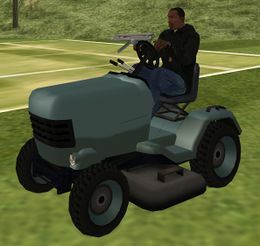 A Mower in GTA San Andreas. The Mower is a riding lawn mower featured in Grand Theft Auto: San Andreas. As mentioned, the Mower is designed as a low-powered sit down mower, but is unable to mow or chop people (in the same manner as the Combine Harvester), or cut grass. Due to its nature, the Mower is generally slow, and while the vehicle is easy to control when traveling normally, the vehicle handles more poorly when picking up speed going downhill. The vehicle is thus the slowest in GTA San Andreas, after the Sweeper. However, as it is motorized, the vehicle can be repaired at a Pay 'n' Spray. Despite being an open air vehicle, the Mower will not dislodge the player when it rolls over as the vehicle is not designed with characteristics of bicycles, motorbikes or quadbikes. Instead, the player will remain seated, even if the vehicle is completely upside down, "burying" the upper half of the player character underground. Additionally, the player cannot preform a drive-by from the front of the mower. The Mower plays the radio station K Rose by default when entered. A similarly designed riding lawn mower is featured in Bully, where it is much more detailed. Radio stations played within the Mower play at a very light tone without any strong bass, simulating the effect of playing music in an open air vehicle. Inside the gates of a mansion in northernmost part of Mulholland, Los Santos. Near house pool east from Mulholland Safehouse, Mulholland, Los Santos. In a square lot in Richman, Los Santos. Parked behind a house just to the left of the Dillimore Safehouse in Dillimore, Red County. Due to programming error, the vehicle is partially spawned in a tree. One of the south-easternmost houses in Palamino Creek. Inside a garage next to a house on the northern part of Palamino Creek. Near a home in The Farm, Flint County. This page was last modified on 8 August 2012, at 09:38.